Join P.J. 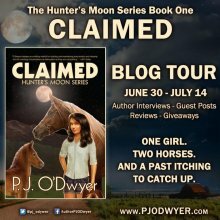 O'Dwyer as she releases her first young adult title. P.J. 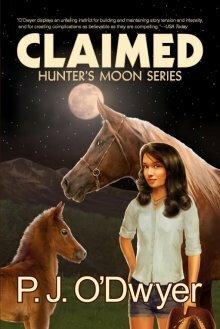 also has a very successful romantic suspense series with a horse theme. Mac jerked. A light-colored, four-door pickup pulled up alongside them with the lights off—probably why they hadn’t seen them—with two teenage boys inside. Considering Mac and Caroline were dirty, bleeding, and had tree bark and leaves sticking out of their hair, these dudes were either blind, stupid, high, or drunk. The last two possibilities had Mac yanking Caroline’s sleeve and maneuvering them closer to the trees. “Where you headed?” the one boy said, hanging out the passenger window. Mac glanced at Caroline and shook her head a definite no. Ignoring them, Mac and Caroline kept walking. Panic rose incrementally in Mac’s chest the longer they rode ever so slowly next to them. And they were smart, too. Mac snuck a peek at them. The one hanging out the window had short-cropped blond hair and a nice smile. The other boy, driving, was left in shadow, but she couldn’t miss the Stetson. Yippee-kai-yay. We’ve got ourselves a cowboy. Mac set her kickstand, moving away from her bike and the truck. She motioned to Caroline to follow her. A well-shaped brow rose over a curious sapphire eye, and Caroline remained stubbornly rooted with her bike. “They’re not ax murderers.” Caroline snorted with laughter. “Shh.” The heat rose in Mac’s cheeks. Maybe she was being dramatic. But they didn’t know them. Or—and this was a biggie—trust them. “You girls change your mind?” the blond called out. With their bikes, they walked over to the pickup, now parked. “Can you take us to County Road 103?” Caroline said to the one in the passenger seat. Mac grabbed Caroline’s arm, hard. “Why would you give them our real names?” she said under her breath. “Cuz . . . they gave us theirs?” She shrugged, embarrassed. Yeah, well, she assumed they gave them their real names. Mac shook her head. This wasn’t good. He took Mac’s bike and hefted it into the back. Caroline looked to Mac. For a girl who had all the answers, she was awfully quiet now. The boys, although taller than them, could only be a few years older. Maybe they were close to seventeen—maybe as young as sixteen. If anyone should be concerned, it should be them. After all, she and Caroline were the juvenile delinquents. 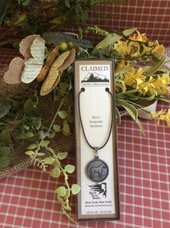 Prize: Keepsake Necklace Inspired by Heroine Mac Stonebreaker & Kindle eBook copy of Claimed!